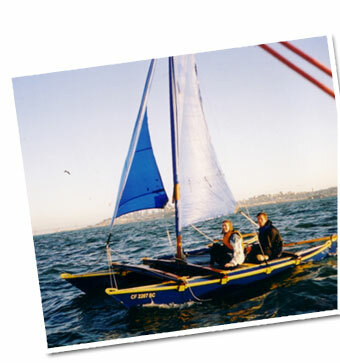 We christened the boat 'Far Out' and launched her on April 21st, 2001. Since then, I've had the boat in the water for some 6-8 months, and would you believe those blue tarp sails are still holding! She seems to point well, and she outperforms all the monohulls on the bay even to windward. As is typical for catamarans, she isn't very manoueverable and is slow to come about. She tacks fine in light winds although in larger seas and strong winds, she has a tendency to stall midway through the tack... which is not a huge problem if you know to backwind the jib, and steer while sailing in reverse. Despite the large turning circle, jibing is a dream... with no boom to knock you unconsious, and the twin hulls for stability, there are no worries about an accidental jibe. - Indeed I'm going to coin a new phase called 'chicken jibing' when the winds are too strong to tack, you can always jibe! Of course the greatest thing about this boat is her speed on a reach. WOW! - In a good wind, she goes like a missile, with the rigging and the boat squealing as she slices through the water. - It's exhilarating. - I once clocked 18kts with my GPS, although this was with currents in my favor, and so 15kts through the water is more true. In comparison to a hobie cat, her hulls are quite heavy and I've yet to fly a hull even in the 25kt winds typical in SF Bay. - Although this is perhaps because I make early use of the reefs in the sail, and usually have a couple friends aboard. At speed, she's a wet ride, and wet suits are essential here. In larger seas, The front crossbeam seems to catch the waves which will almost completely stop the boat in it's tracks. Quite a jolt. - I'm considering constructing a rounded coaming to deflect the water more smoothly here, although I doubt it will solve the problem entirely. - I've heard of people taking the front crossbeam off, but I've occasionally found the crossbeam lashings working loose, and would rather not risk having my boat divide into two in the middle of the bay. The blue tarp sail, which was the greatest source of amusement to all who saw them, actually performs quite well! - They have lost some of their shape, but the material seems to handle the load of 30kt winds just fine. - While I've blown out both clewboards, the sails have always held. However, they have not stood up to abrasion so well. - On a run, the sprit will chafe the sail between itself and the shrouds. - This is causing a fair amount of wear, which I have pre-emptively patched with duct tape. On our last sail in 25kt winds, the grommet at the head of the sail blew out, so I'm looking forward to my new pair of dacron sails this summer. Like many others before me, I'm ditching the sprit rig for a gaff. - The banging of the sprit, and the abrasion on the sail just aren't worth it. However, the mast needs to be taler for a gaff rig, and consequently I have had to invest in a new mast, new gaff, and new shrouds. - So if you're considering building one of these boats... I strongly advise you to go and use Wharrams Tiki gaff rig instead! Oh, and one other note... be sure to sew a zipper in the wing of the sail, or you'll have to leave the sail on as long as the mast stays upright! I think I'll also opt for hard hatch covers, so there's a couple projects to keep me busy through winter.